XPassGen is an application to generate secure passwords, in such a way that they are really difficult to guess or find out. To do so, the technique chosen to create these passwords has nothing to do with the topics that recommend that we use tricks like joining the birth date together with the initials of a family member or our pet to form an alphanumeric code. The password generation process used by XPassGen is totally random, in fact, it's based on the movement that you do with the mouse cursor within the programs windows. 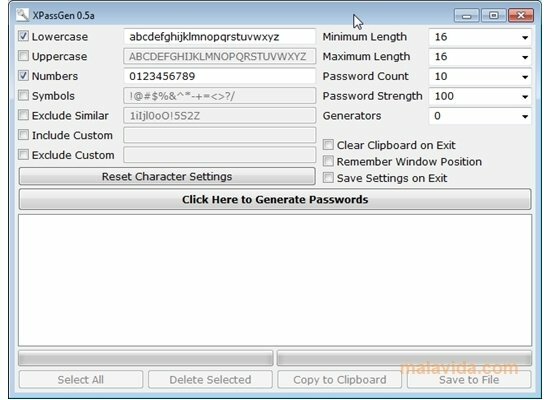 In the generated codes you will be able to include numbers, lowercase and uppercase letters, symbols,... Furthermore, you can also determine the length that you want. This utility is highly recommendable for any user that has one or several email accounts, that carries out online banking or that uses many of the most common web services and that requires to have an account name and a password. If you run out of imagination and need an efficient tool to generate the passwords, use XPassGen.